Take Part In The ‘Poker Punchout’ And Win Cad $100,000! 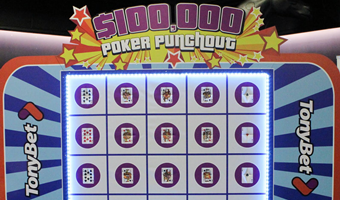 The latest news, however, sees the addition of the ‘Poker Punchout’ game at the venue! If you’ve ever wanted to play on a gameshow, this is your chance. To be eligible, you simply need to deposit onto your Tonybet account, from the Playground cashier, during the month of March. Participants will need to present themselves at Playground Poker Club on the following Monday (March 14, 21, 28 and April 4, respectively) at 7:00pm; at which point they will each play Poker Punchout, for $10,000! The grand prize is $10,000 for the first 4 games (March 14, 21, 18 and April 4), and $100,000 for the finale (April 4). The Tonybet Power Weekend CAD$135+CAD$15 NLH re-entry CAD$100,000 guaranteed NLH Main Event features four day ones. Day 1A is Wednesday March 9th at 7pm EST, with subsequent day ones up until Friday 11th. On Friday 11th as well as a flight at 7pm there is also one earlier at 11am. This week Tonybet Poker introduced a new approach to rakeback giving players even more value. See: https://tonybetpoker.com/blog/introducing-the-new-rakeback for more information.